People have been pulling water out of wells for a long time, and yet these days they are an object of mystery for us city dwellers who’ve grown used to just turning on a tap whenever we’d like a drink. When you get right down to it, wells — especially drilled wells — aren’t really all that hard to understand. A hole approximately 6 inches in diameter is drilled down into the bedrock anywhere between 100 to 500 feet deep. The top 20 feet of the well hole contains a metal casing that prevents surface ground water from entering the well, and this casing extends a few feet above the ground. Ground water seeps into the well hole through fractures in the bedrock,filtering it ,and at the sametime filling it to “static level”, also known as the depth water reaches naturally without being pumped higher. How do you get water out of a drilled well for use? Like anything, there are a number of options depending on your needs and budget. The simplest and least expensive option is a manual pump. A manual pump is attached to the well casing extending out of the ground, and a long pipe descends down into the well, below the water level. Pumping the lever draws water to the surface for collection. The water is, of course, unfiltered, so while it may not contain biological contaminants, it may not be immediately suitable for drinking without some sort of filtration. Still, it’s perfect for doing dishes and having showers. Shallow pumps are intended for pumping water that is no deeper than 25 feet. These can be purchased for as little as $50. Deep water manual pumps can draw from depths as low as 400 feet and cost anywhere from $500-$2000 to install, depending upon the depth from which you have to pump. Your choice will depend upon knowing the static water level, which should be on the documentation provided to you upon the sale of a property. Electrical well pumps also come in all sorts of configurations, but the key here is that they require power in order to operate. This means they either have to be tied into the grid or powered by generator or solar. If the well is a lower producing well — say less than one to two gallons per minute — a water storage tank or cistern maybe necessary. A submersible pump is inserted near the bottom of the well and connected to the surface by a pipe and electrical cable. Pumps cost roughly $2000+, and expect to pay another $1000 for piping electrical cables. The pump (whether solar powered or connected to the cabin’s power system) slowly fills up the cistern, which can run $650 for a 1000 gallon tank. 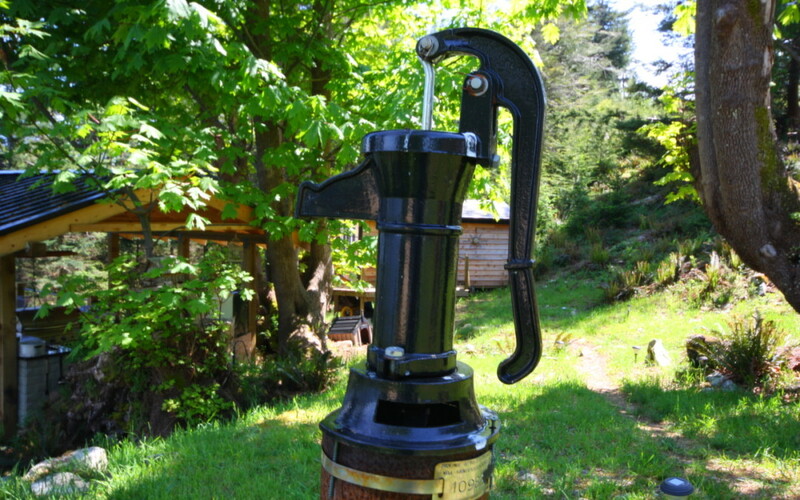 A small pump in the cabin pulls water from the cistern into a pressure tank (approximately $200) in the cabin. From the pressure tank, the water passes through a water filtration or conditioning system, which can run $500+.